Since I have a Juniper EX2200 performing my layer 3 routing for internal traffic and I have Sonos on a separate subnet than some Sonos clients, I needed to allow multicast across subnets. By creating a loopback interface and using it as my PIM rendezvous point, I was able to get my Windows desktop on 10.1.20.0/24 (Wired) find my Sonos speaker on 10.1.50.0/24 (WiFi). This is pretty much taken directly from the guide here. I have subnet 10.1.20.0/24 on vlan.20 for trusted wired, 10.1.40.0/24 on vlan.40 for guest wifi, and 10.1.50.0/24 on vlan.50 for trusted wifi. Since Sonos is on vlan.50, I want all three VLANs to share multicast. You can block multicast from guest wifi to trusted wired via a firewall filter. Note on 2018.5.20: This is a first draft. This will undergo many revisions. I used many, many other tutorials, blogs, and Q&A posts to assemble this. Relevant links are sprinkled throughout the guide. Schedule script every boot to set the physical interface used for containers to be UP with PROMISC ON. This is necessary right now on Ubuntu 18.04 due to a bug documented here. The following command will write to crontab so that your script runs as root at boot. This did not work with only the first sudo, so I threw a bunch of extra sudos in there to make it work. I don’t know if they are all necessary. I have extra physical interfaces that I’m not using right now, so I’m shutting them down. Run script to update. You can run this whenever you want to update. Import zpools at boot. Not necessary if you reference the disk by-id when doing initial import as discussed here. This section is entirely optional. I like being able to access my entire media ZFS pool from Windows. Install Samba as described here. Check lxc version. On 18.04 it’s 3.0.0 right now. The outcome of these steps is that the network configuration from the lxcnet profile is copied to the default profile, and the default profile is populated with the ZFS pool information. 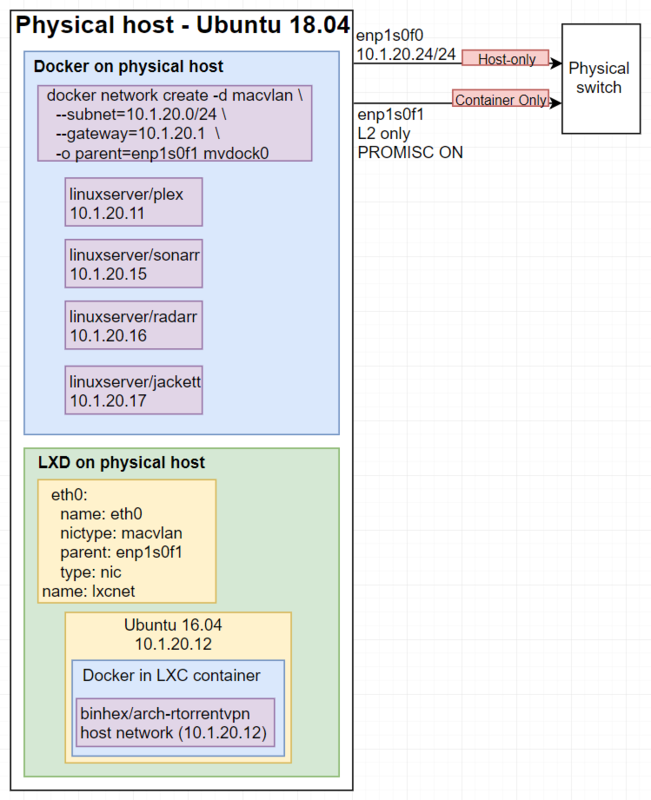 If you want to use an ipvlan instead of a macvlan in Ubuntu 18.04, you will have to start docker in experimental mode. Q: Why don’t you just run the vpn/torrent docker container on the host? A: I tried to do that with the network=mvdock0 and ip flags, but it wasn’t working. I think it has something to do with the way the VPN is influencing the network connection. By making the vpn/torrent docker container use the “host” network and having the “host” actually be an LXC container, I can still ensure this traffic passes through enp1s0f1 on the physical host. Q: Why not do all LXC or all Docker? Why mix and match? A: First, so I could learn both. Second, Docker is so easy to get my applications up and running. Third, my inspiration for this project was this amazing post by Jason Bayton, and I loved the idea of hosting LXC containers in ZFS. As it turns out, I only hosted one. But perhaps more soon! This took me many hours to assemble, as I had very little LXC or Docker experience before setting out on this journey. I’m sure people will point out many, many flaws in this tutorial. Please comment so that I can fix them! If this guide helped you, please consider a small crypto donation! Okay, I feel the need to write this because I just upgraded from FortiOS 5.4.0 to FortiOS 5.4.1 on my FortiGate 90D-POE, and my FortiAP couldn’t handle it. I actually had to completely reconfigure my FortiGate from scratch, as I lost everything but console access whenever I would attempt to import my configuration. 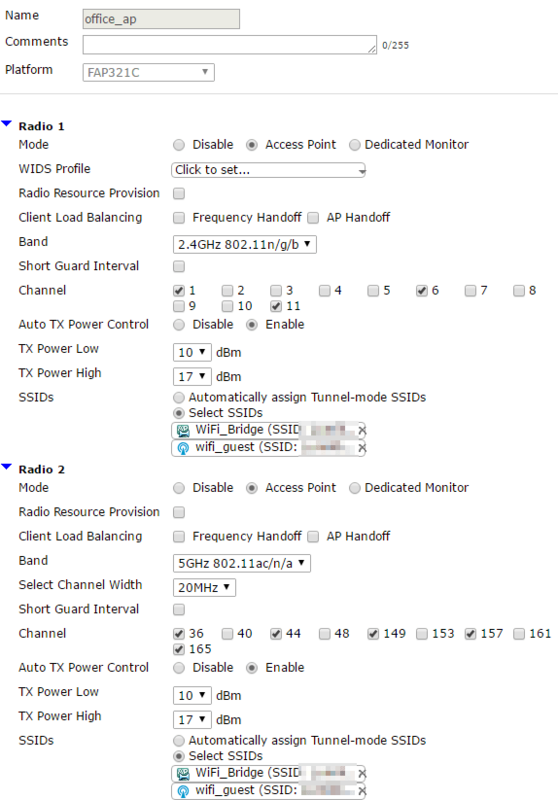 I chose “Tunnel to wireless controller” for my guest network because I want to apply different levels of UTM to guests than I do to my own WiFi traffic, and if I bridge both SSIDs to the FortiAP interface, I can’t apply separate UTM policies. Note: I use the term “bridged wireless clients” here for settings that specifically apply to devices connected to my private WiFi network that will have access to my wired devices through a firewall policy. If you create a guest network (tunnel to wireless controller), it will have its own subnet and DHCP server as explained in a later step. Even without a tunneled SSID, you still need a DHCP server on your POE interface for your FortiAP to receive an IP address. Edit the POE interface where you connect your FortiAP. 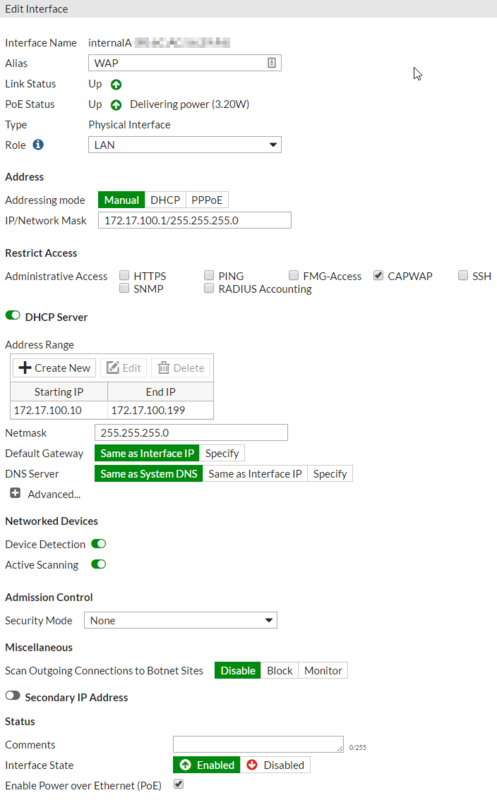 Select LAN role, Manual addressing mode, type an IP/Netmask that will act as a gateway for your bridged wireless clients (I chose 172.17.100.1/255.255.255.0), select only CAPWAP for administrative access, and create a DHCP server for your bridged wireless clients. Assign a name for the interface (never visible to public), type WiFi SSID, traffic mode “Local bridge with FortiAP’s Interface”, SSID name (visible to public by default but can be made private), security mode, security mode options, and click OK. 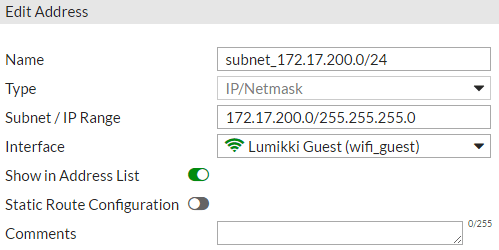 If you wish to create a guest WiFi network, create a new SSID, choose traffic mode “Tunnel to Wireless Controller,” and create a unique IP/Netmask for this subnet, a DHCP server, and finally name your SSID and configure security before clicking OK. 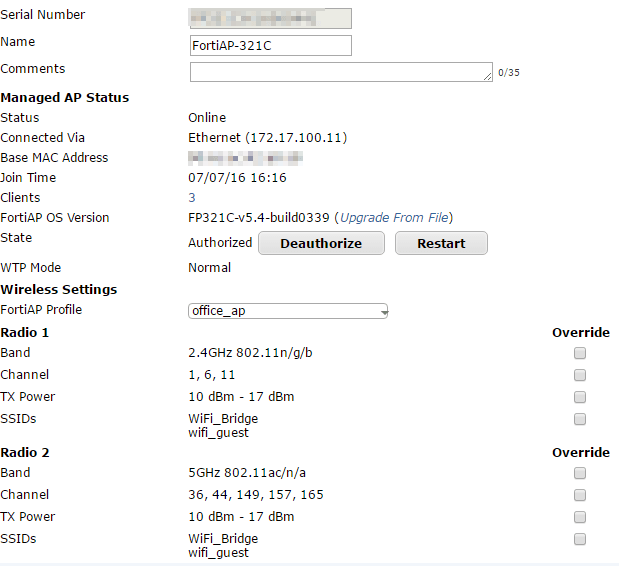 Create New, assign a name, **select your model of FortiAP next to platform (DO NOT SKIP THIS STEP)**, choose your radio settings, choose “Select SSIDs,” and select both SSIDs you created in step 2. You are welcome to limit one or more SSIDs to specific bands if you wish. By now, your FortiAP should have received an IP address from the DHCP server on the POE interface you configured in step 1. If it still does not have an IP address, wait. Periodically, click Refresh. Eventually, it will get an IP. This should not take more than 5 minutes, but the time can vary by model. Assign a name (optional), Authorize the AP, assign the FortiAP Profile you configured in step 2, and configure any override settings as you wish. With my FortiGate 90D-POE on firmware v5.4.1-build1064, a Fortinet support representative had me upgrade my FortiAP OS version to FP321C-v5.4-build0339. Create a name for your bridged (private) WLAN, put in the same subnet you created in step 1-1-B, and assign it to your POE interface. Click OK. Create a name for your tunneled (guest) WLAN, put in the same subnet you created in step 2-1-C, and assign it to your guest SSID. Click OK. Create an address for your internal hardware switch if you don’t already have one! Create New, assign a name, POE interface as incoming interface, internal hardware switch as outgoing interface, address you created in step 4-1-B as source, address you created in step 4-1-E as destination, service ALL, uncheck NAT if selected, ensure “Enable this policy” is checked and click OK.
What this policy does: Allows devices on your private, bridged WiFi network to communicate with devices on your internal hardware switch. Create another policy for the reverse direction (internal to WiFi). See screenshot. 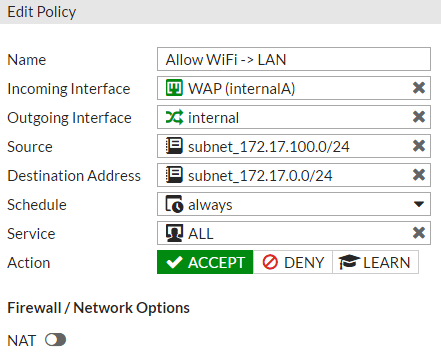 Because you already have a firewall policy that allows devices physically connected to your internal hardware switch access to the internet, you can simply add your POE interface and guest SSID to this policy. Personally, I created a separate policy for my guest WiFi so I can apply more granular control in the future. That’s it! If this helped you, please consider a donation of any amount at all via the PayPal or Bitcoin buttons on the left side of the page. Comments and criticisms are welcome in the comment section. Note: I do not know how to get TV working if you use that service. This tutorial covers internet only. I configured the internalA interface for my FortiAP 321C and disabled internalB, C, and D.
I have successfully tested the following configuration under firmwares 5.4.0-build1011 and 5.4.1-build1064. 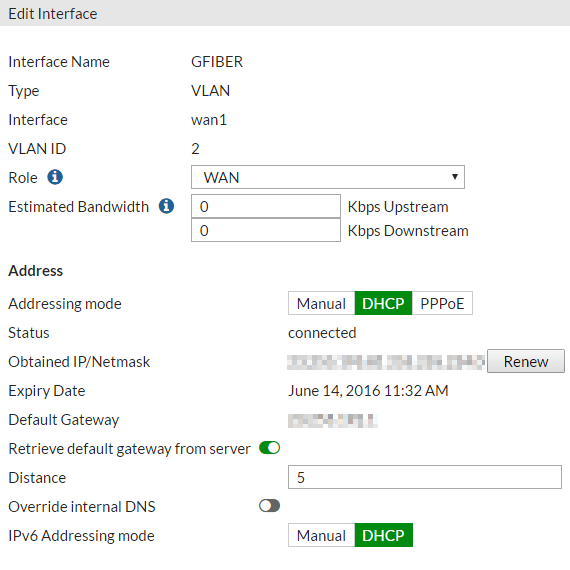 Assign a name, type VLAN, interface wan1, VLAN ID 2, role WAN, addressing mode DHCP, click OK. I called mine GFIBER. Assign IGMP as the name, protocol type IP, Protocol Number 2, click OK. 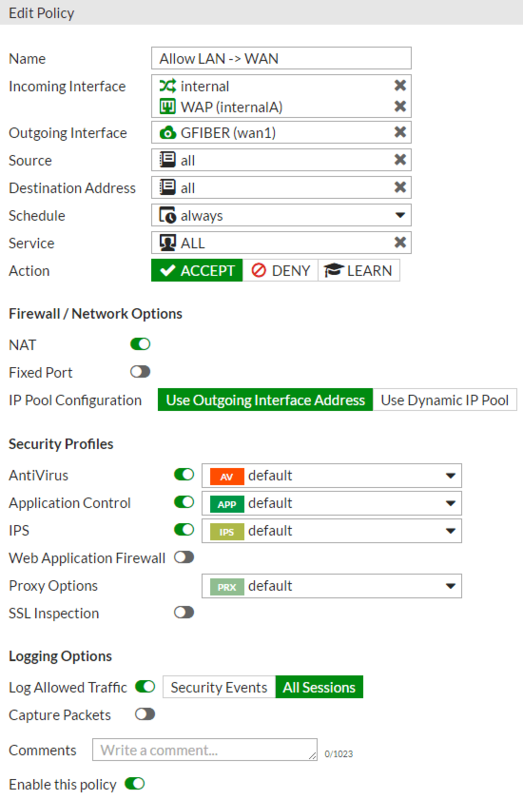 Assign a name (I chose “QoS DHCP”), select your internal subnet(s) for incoming interface, select the VLAN interface you created in last step for outgoing interface, source all, destination all, schedule always, service DHCP, action accept, NAT enabled, do not assign any security policies, click OK. Assign a name (I chose “QoS IGMP”), select your internal subnet(s) for incoming interface, select the VLAN interface you created in last step for outgoing interface, source all, destination all, schedule always, service IGMP, action accept, NAT enabled, do not assign any security policies, click OK. 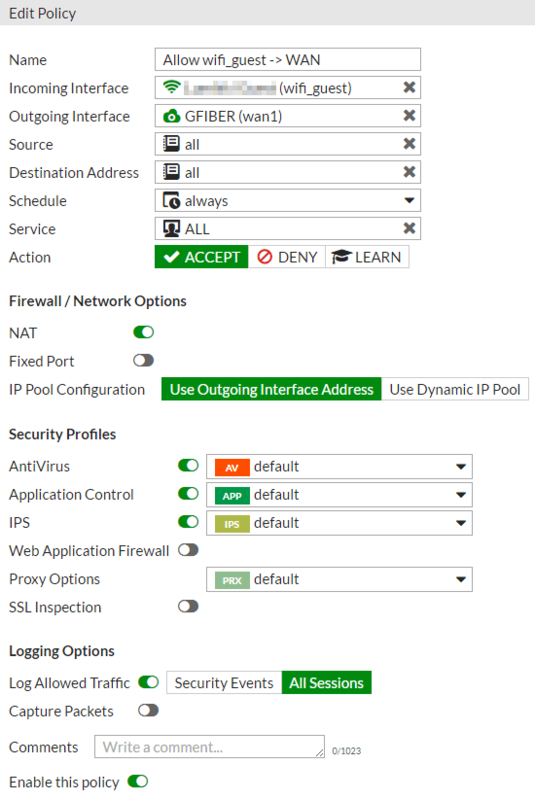 Assign a name (I chose “QoS All Others”), select your internal subnet(s) for incoming interface, select the VLAN interface you created in last step for outgoing interface, source all, destination all, schedule always, service ALL, action accept, NAT enabled, select the security policies you wish to use on the traffic between your LAN and the WAN, click OK.
Make sure “QoS All Others” comes after the first two policies in the list of policies. 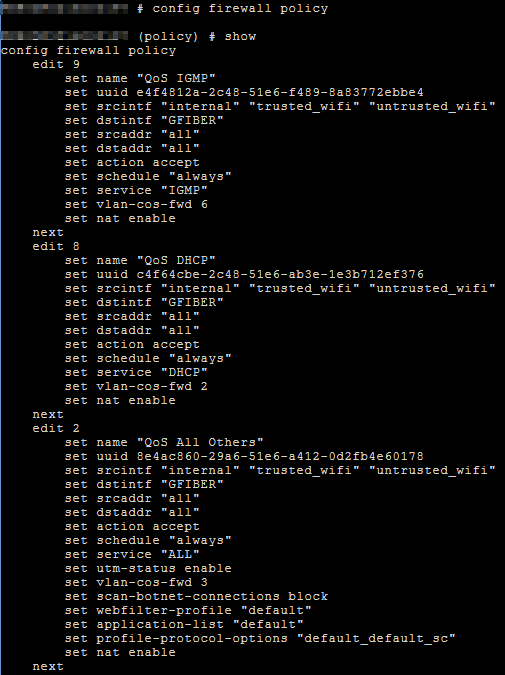 I put them in the order of IGMP>DHCP>ALL. I’m not sure if the order of the first two matters, but both of them must be processed before the third policy, as you want IGMP and DHCP services to match in their own respective policies before the third policy, which includes them, has a chance to match them. This is because each policy will have a unique QoS bit. Note: The QoS bits come from here. Each policy has a unique number assigned to it, and they may be different from mine. My IGMP policy is 9, DHCP is 8, and All Others is 2. That’s it! With these firewall rules in place, I get over 900 Mbps down/up. Please leave a comment if this worked for you!